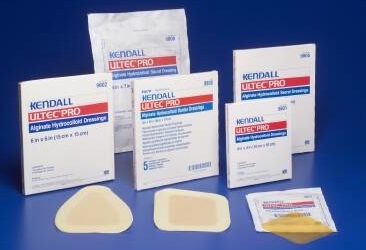 Kendall™ Ultec Pro Alginate Hydrocolloid Dressings are sterile wound dressings designed to use on light to moderately exudating wounds. These dressings provide an optimal moist wound healing environment. The alginate formulation provides greater absorbency to help reduce dressing changes. The thin profile of Ultec Pro Alginate Hydrocolloid helps improve product conformability, reduces chances for “roll up”, and reduces chance of melt down into the wound site. The reinforced integrity helps reduce dressing change frequency.